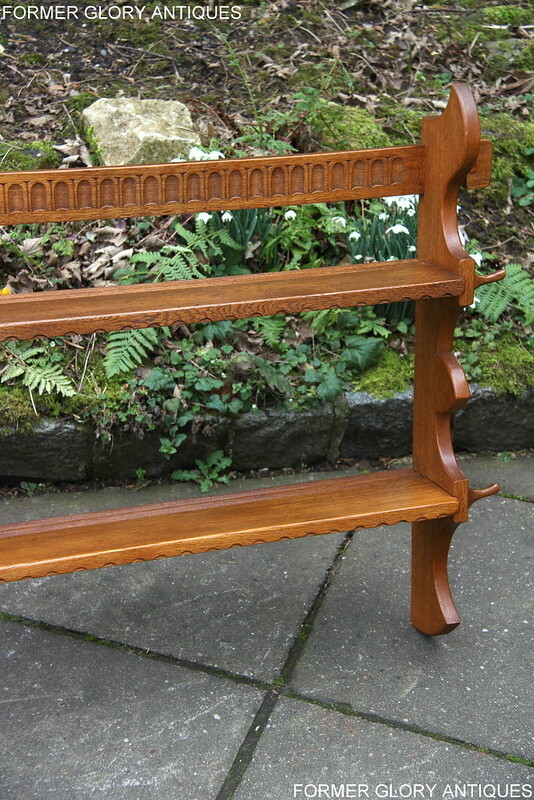 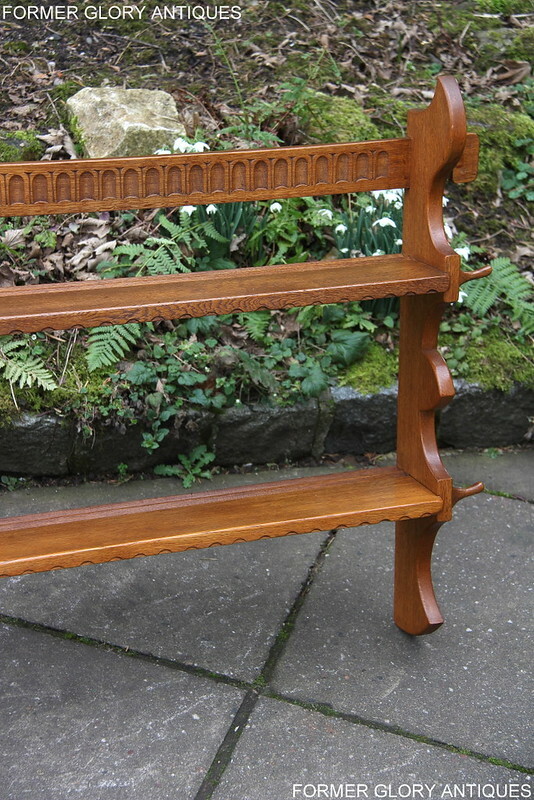 CARVED OAK DELPH RACK / WALL SHELVES. 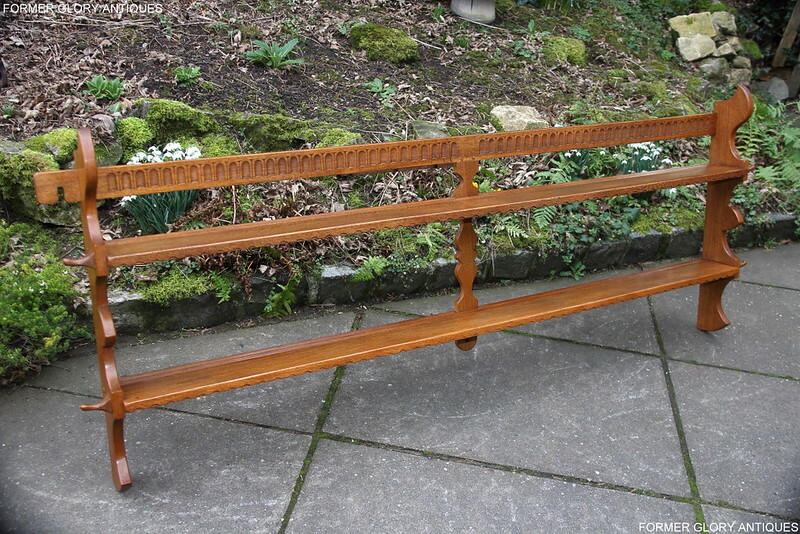 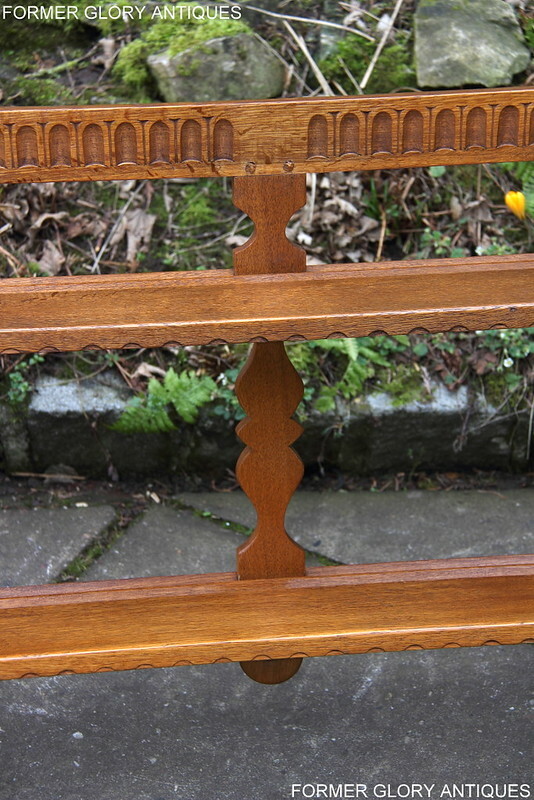 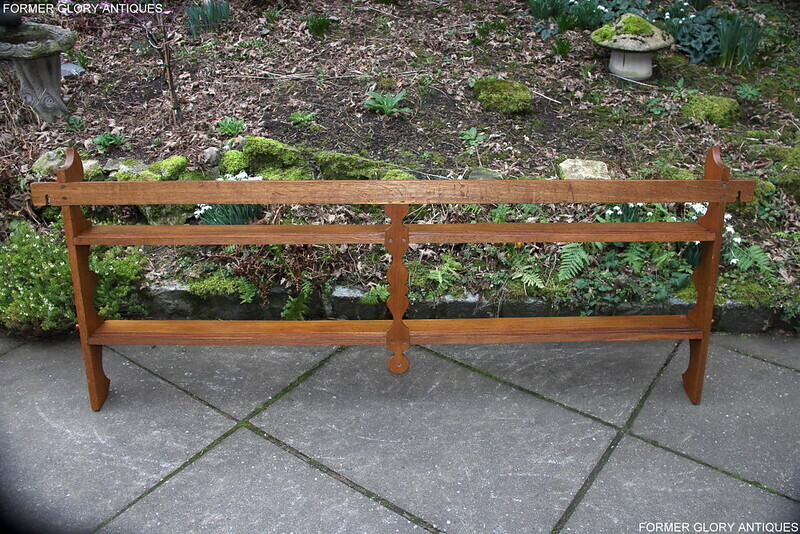 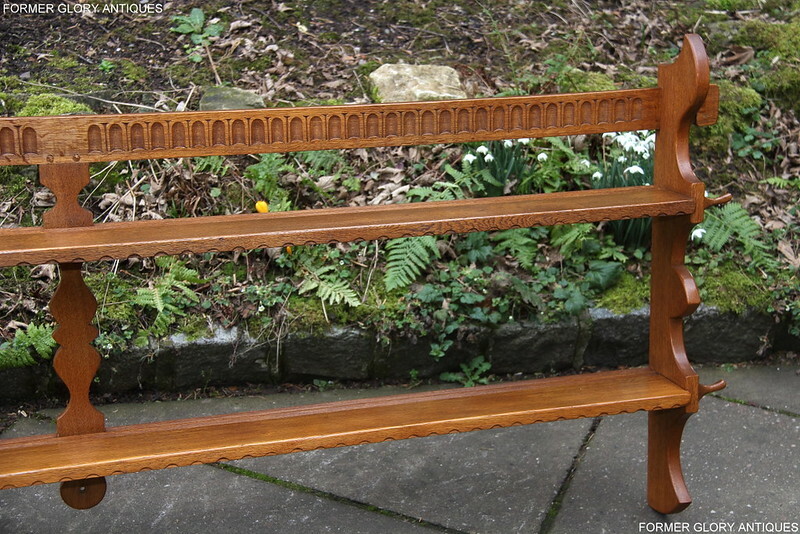 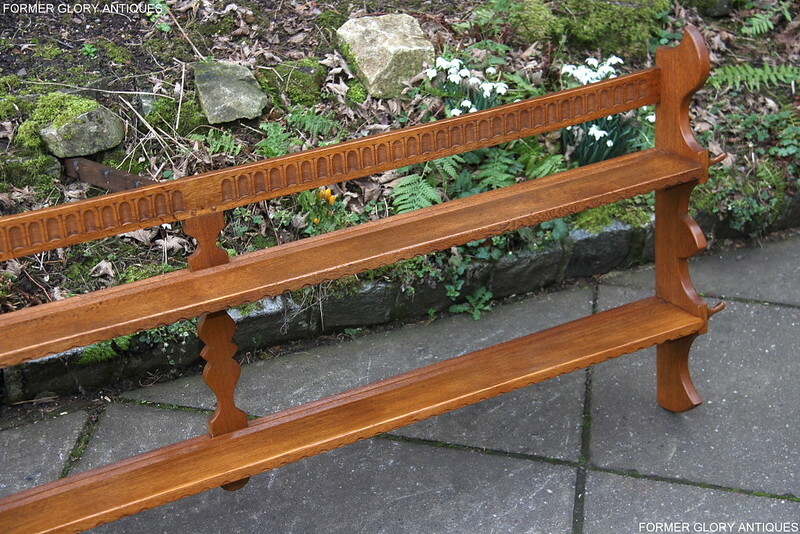 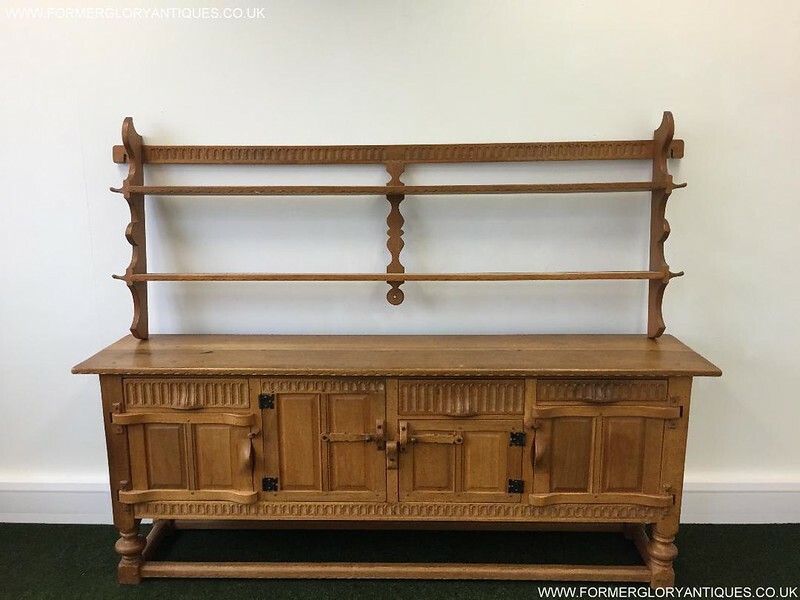 A VERY ATTRACTIVE, MID-LATE 20th CENTURY, SOLID OAK, DELPHER / DELPH RACK, OF EXCEPTIONAL QUALITY AND CONDITION. 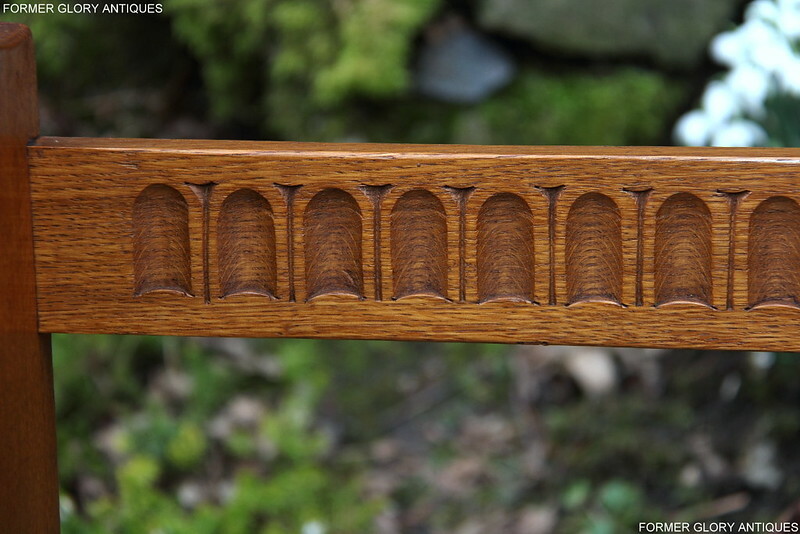 THIS FABULOUS STRESSED, SOLID OAK, DELPHER RACK WAS MADE BY 'RUPERT GRIFFITHS' 'MONASTIC WOODCRAFT LTD' OF BRAILSFORD, DERBYSHIRE, ENGLAND. 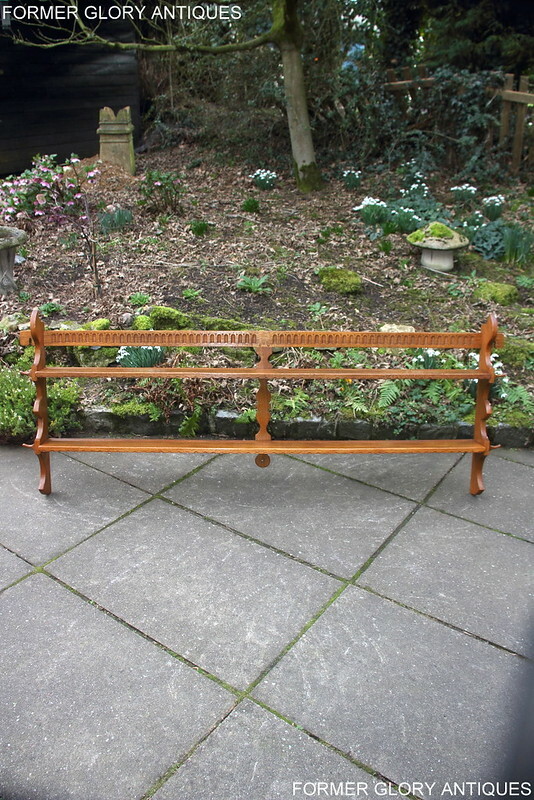 THE 'DELPHER RACK' IS STILL BEING MADE TODAY BY HIS SON 'NIGEL GRIFFITHS'. 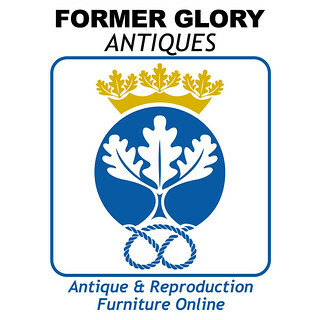 THE 'GRIFFITHS' WORKSHOP / SHOWROOM IS NOW BASED AT THE OLD CHEESE FACTORY GRANGEMILL, DERBYSHIRE. 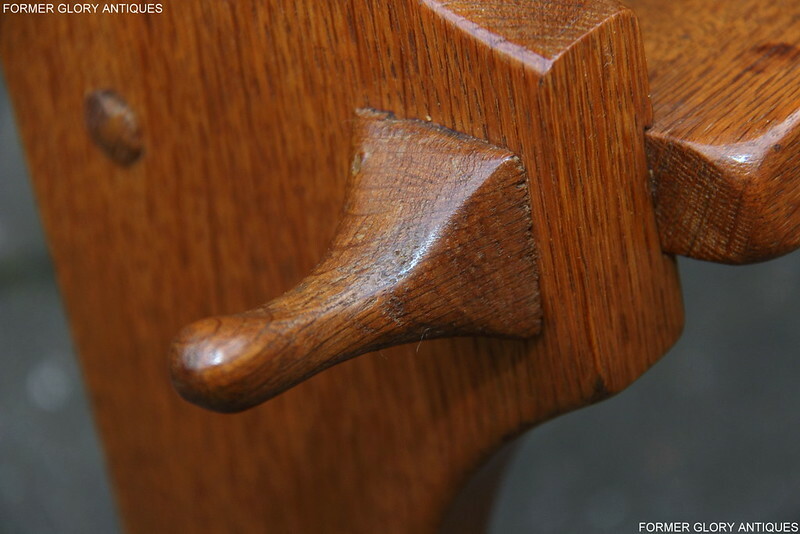 EACH ITEM OF FURNITURE IS INDIVIDUALLY CRAFTED, WITH HAND CUT DOVETAILS AND IS PLANED, SANDED, CARVED, STAINED AND POLISHED ALL BY HAND. 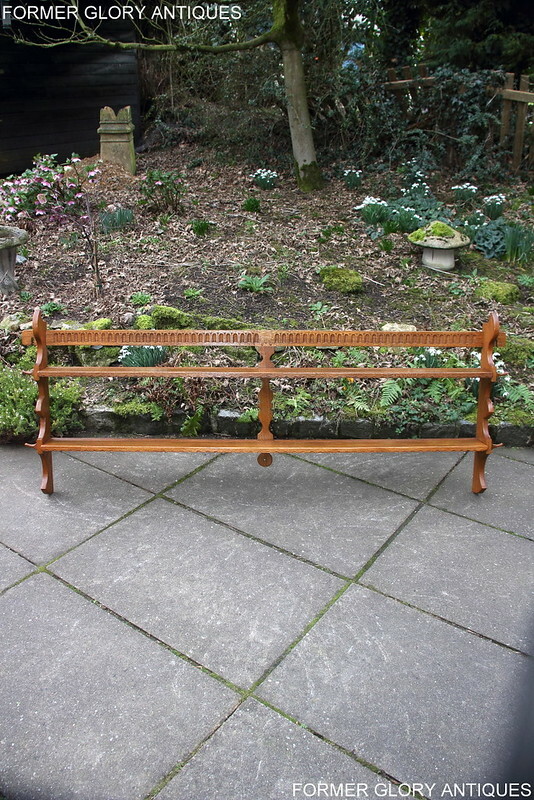 THE RACK IS CONSTRUCTED USING TRADITIONAL METHODS AND ONLY THE VERY BEST QUALITY SOLID OAK TIMBER AND FINISHES ARE USED THROUGH-OUT. 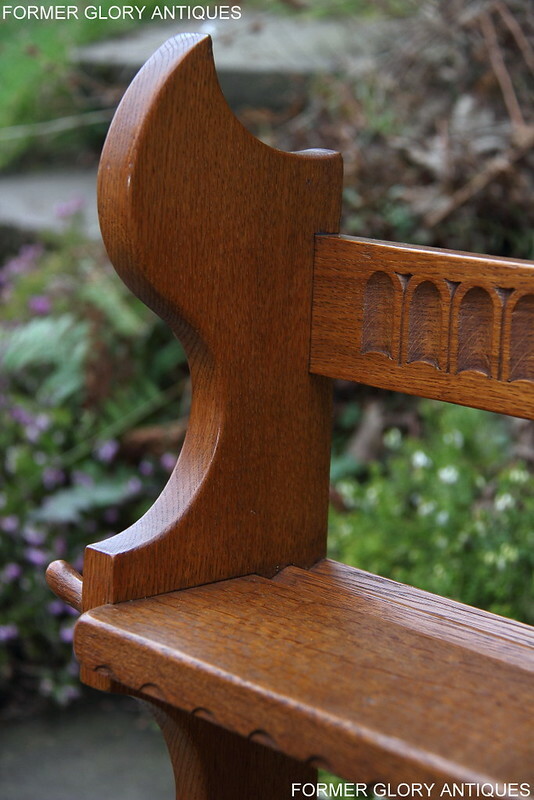 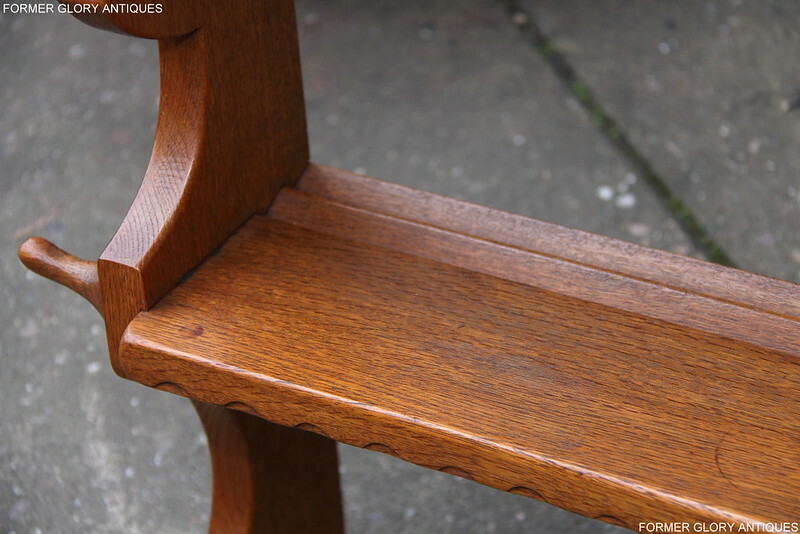 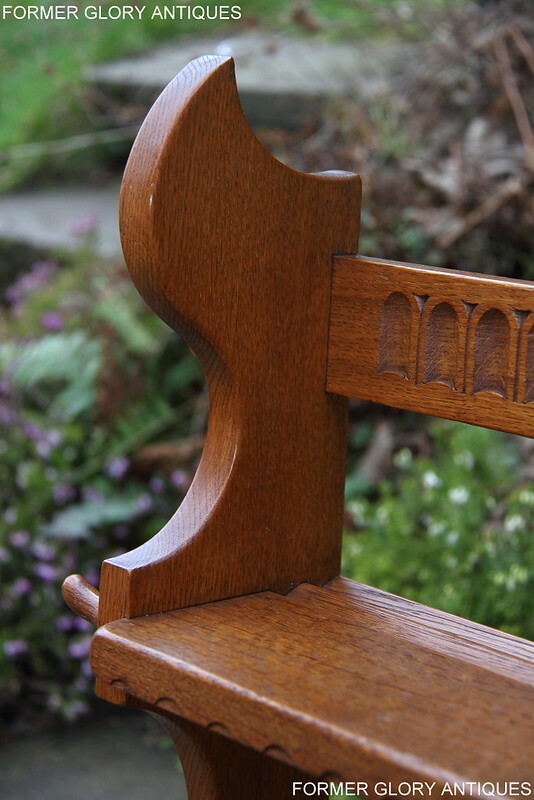 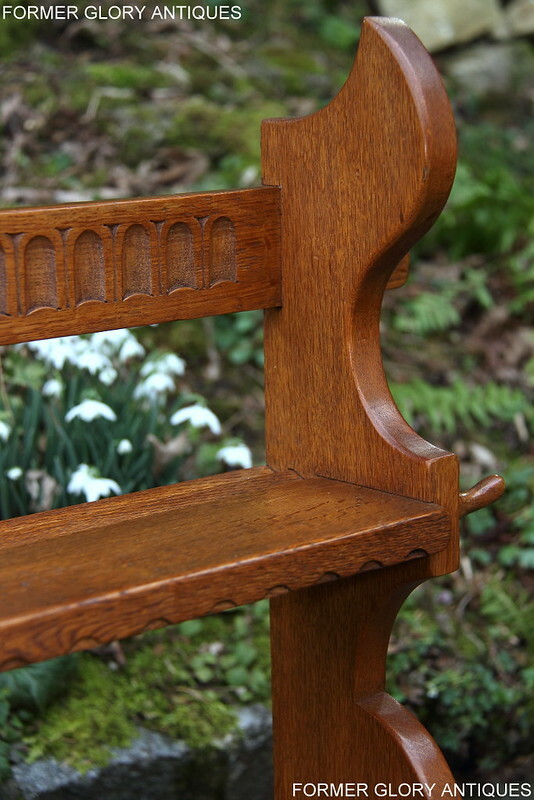 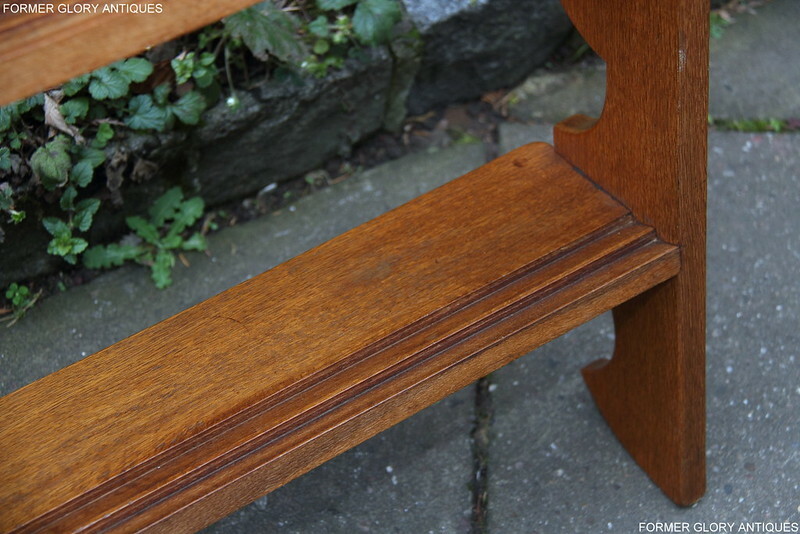 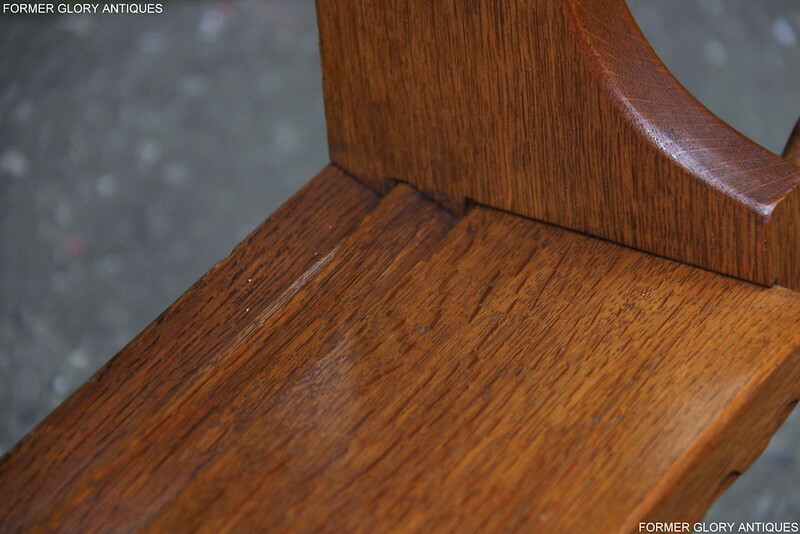 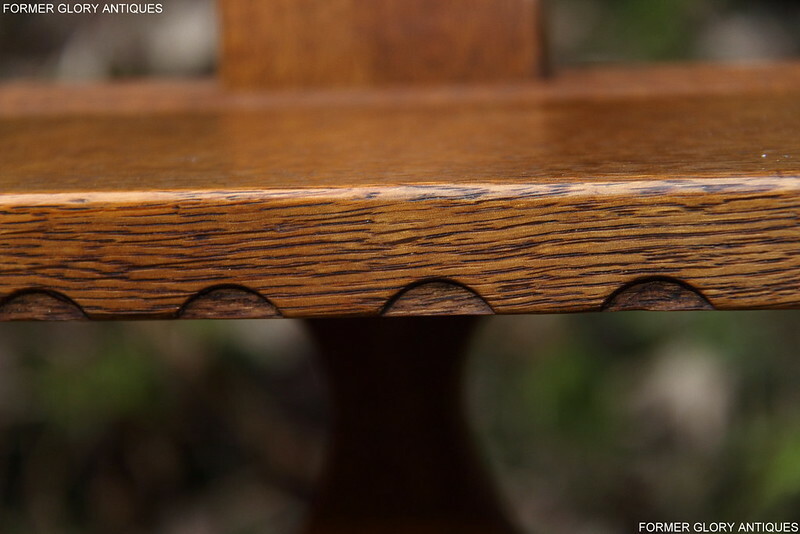 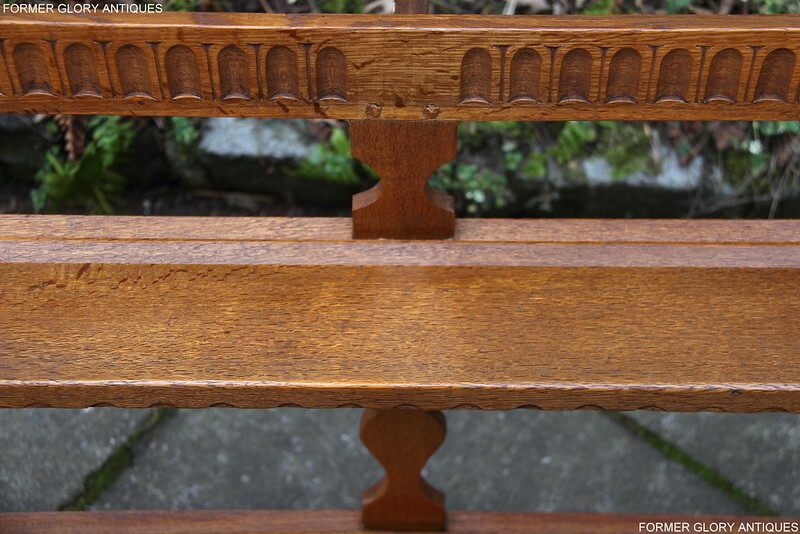 IT HAS ATTRACTIVE OAK-WOOD GRAINING THROUGH-OUT AND WOULD SIT NICELY WITH OTHER MATCHING 'GRIFFITHS' 'MONASTIC', SOLID OAK, 'HAND-CRAFTED' FURNITURE. 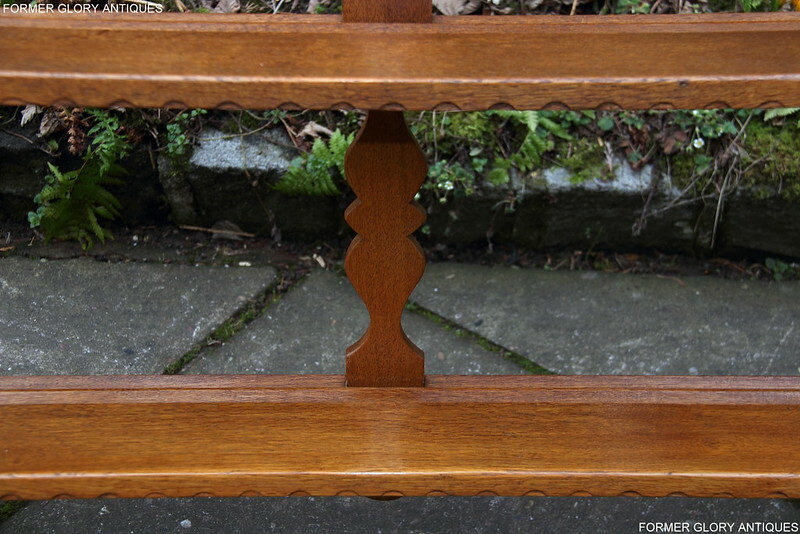 THE RACK IS A RICH LIGHT-MEDIUM OAK IN COLOUR AND IS DESIGNED TO HANG ABOVE A SIDEBOARD OR DRESSER BASE. 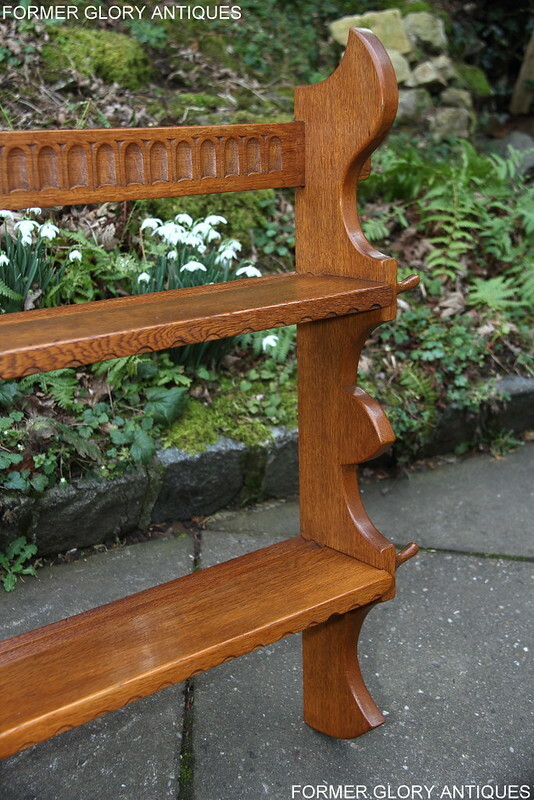 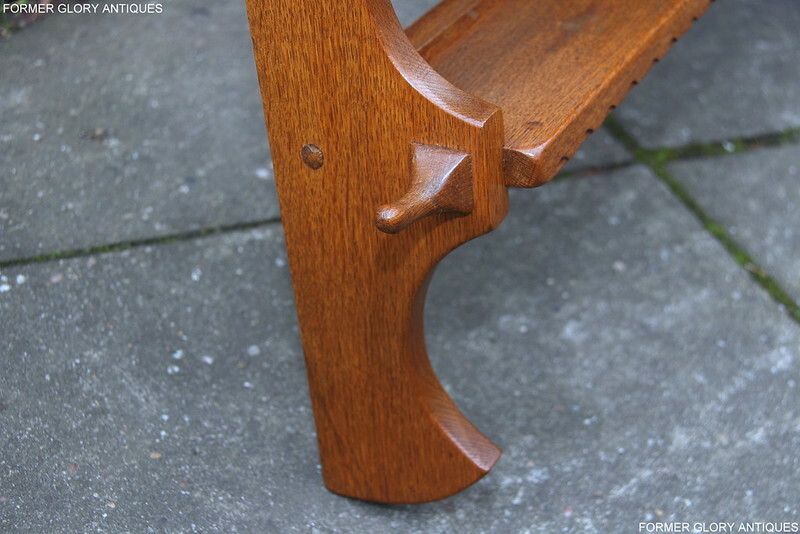 IT HAS A DECORATIVE 'CHOP-CARVED' TOP RAIL, WHICH HAS TRADITIONAL 'STRAIGHT-CUT' EDGES AND VISIBLE PEGGED JOINTS, FOR ADDED STRENGTH. 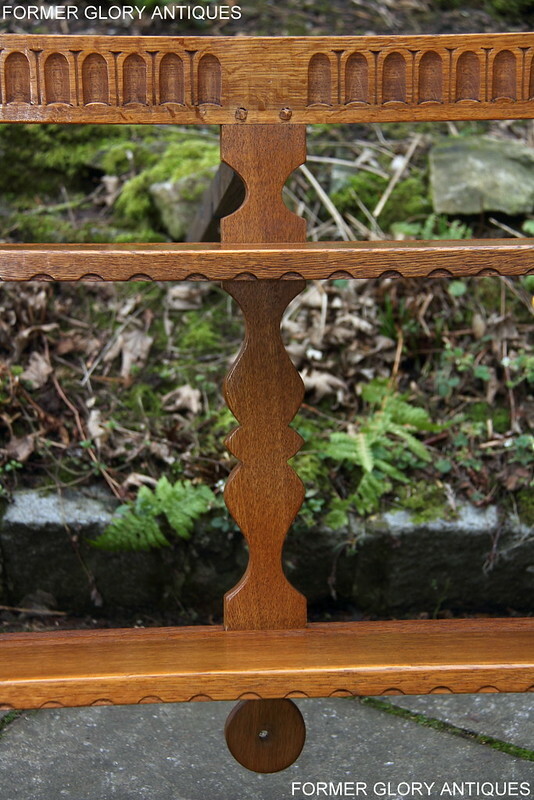 THERE ARE TWO FULL LENGTH SHELVES BELOW, EACH HAS A DOUBLE PLATE STAND GROOVE 'CUT-OUT' AT THE BACK, MAKING THE RACK IDEAL FOR DISPLAY PURPOSES. 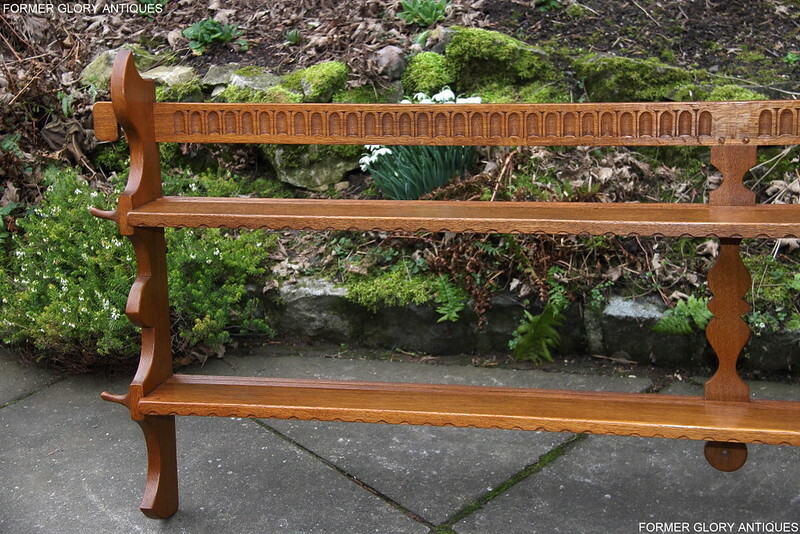 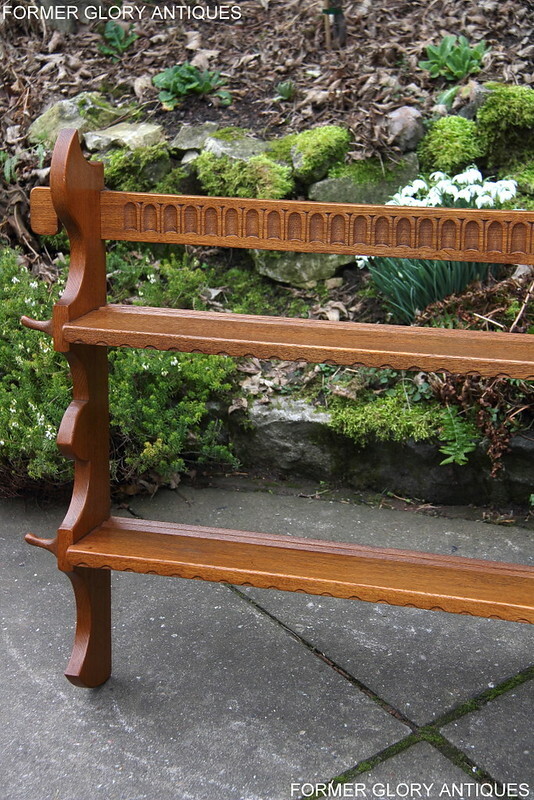 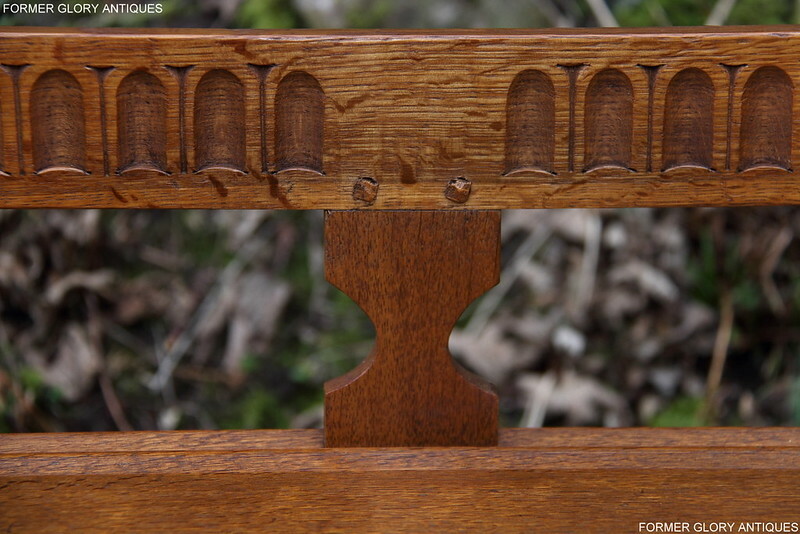 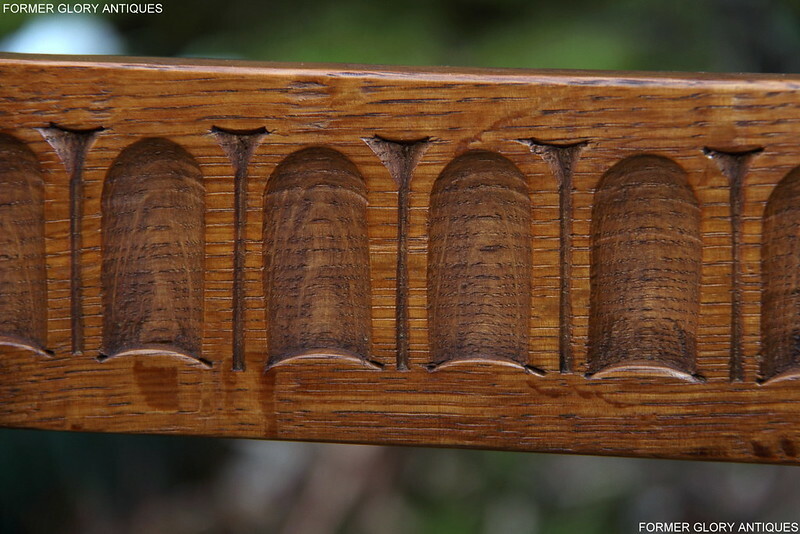 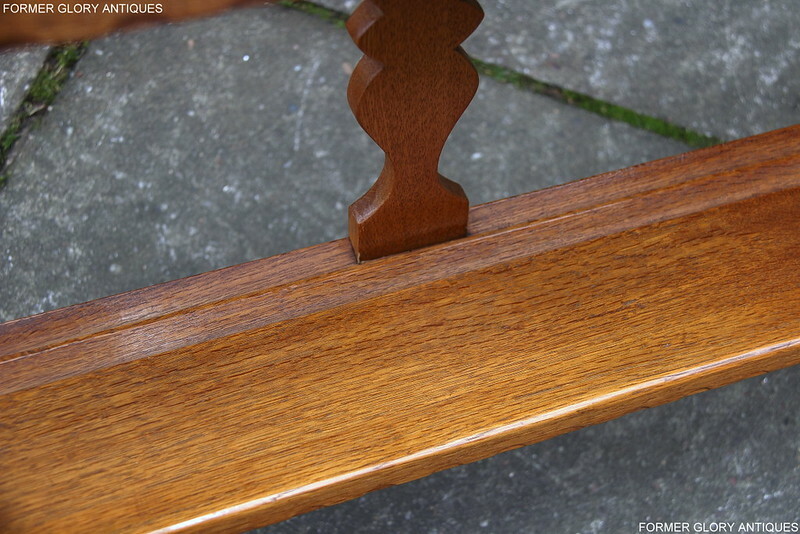 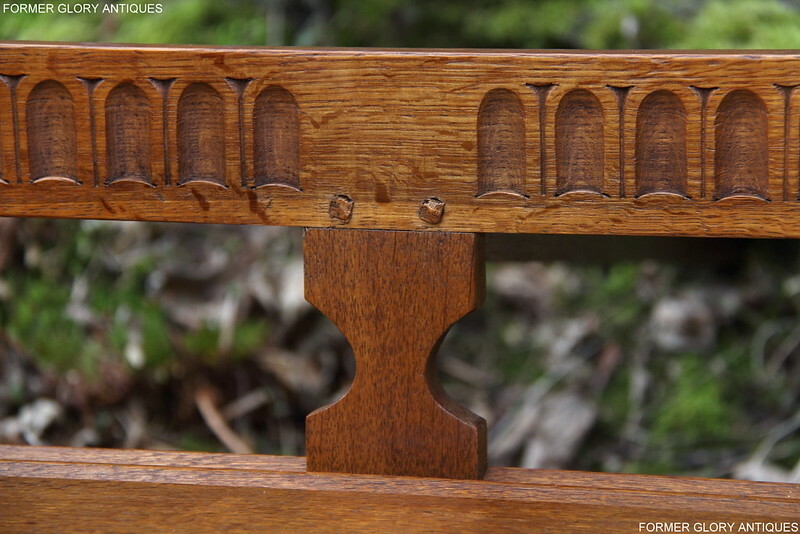 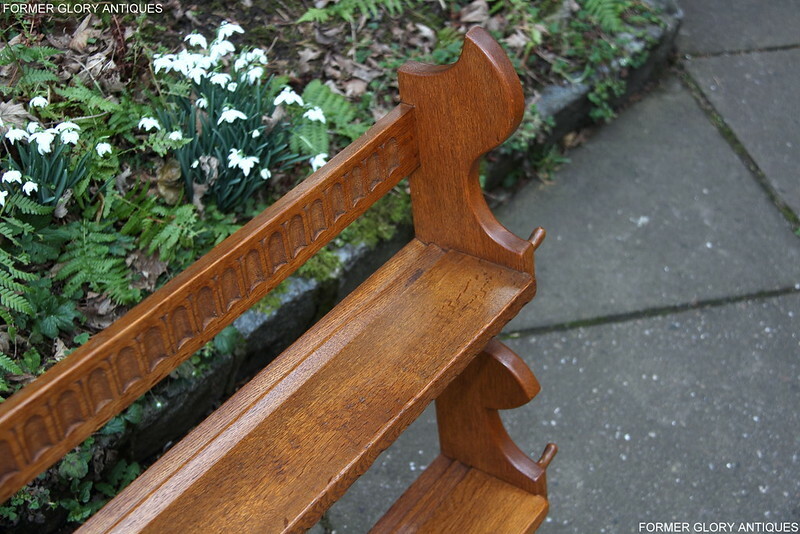 THE RACK HAS DECORATIVE, SOLID OAK, SHAPED SIDES AGAIN WITH TRADITIONAL 'STRAIGHT CUT' EDGES. 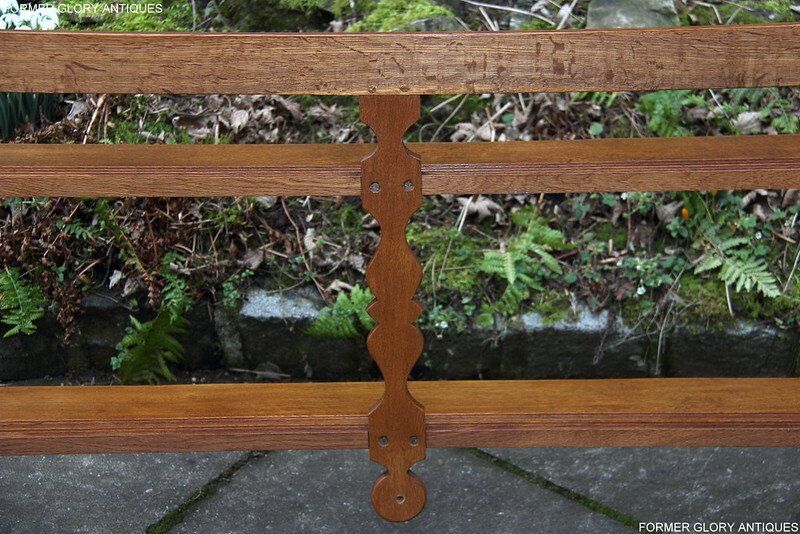 IT ALSO HAS SOLID OAK, 'HAND-CRAFTED', HANGING HOOKS FIXED TO THE SIDES AGAIN IDEAL FOR DISPLAYING PURPOSES. 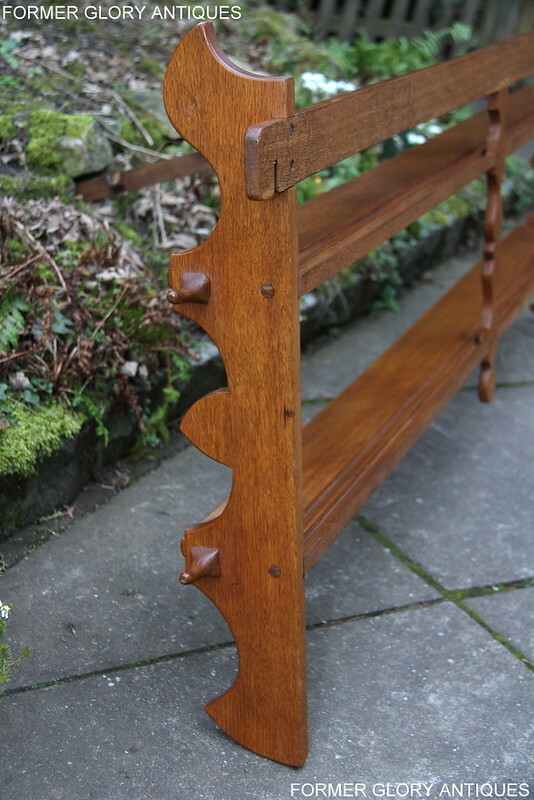 THE RACK HAS A SHAPED CENTRAL PANEL, FOR ADDED STABILITY, WHICH AGAIN HAS MATCHING 'STRAIGHT-CUT' EDGES. 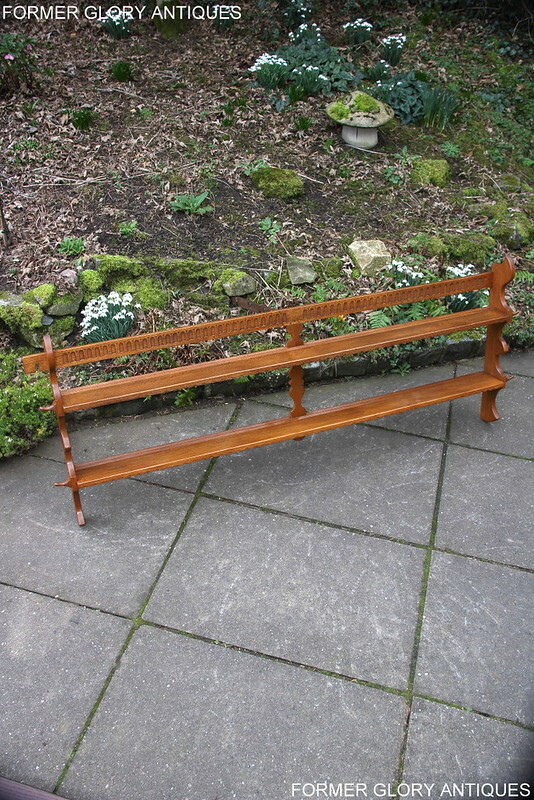 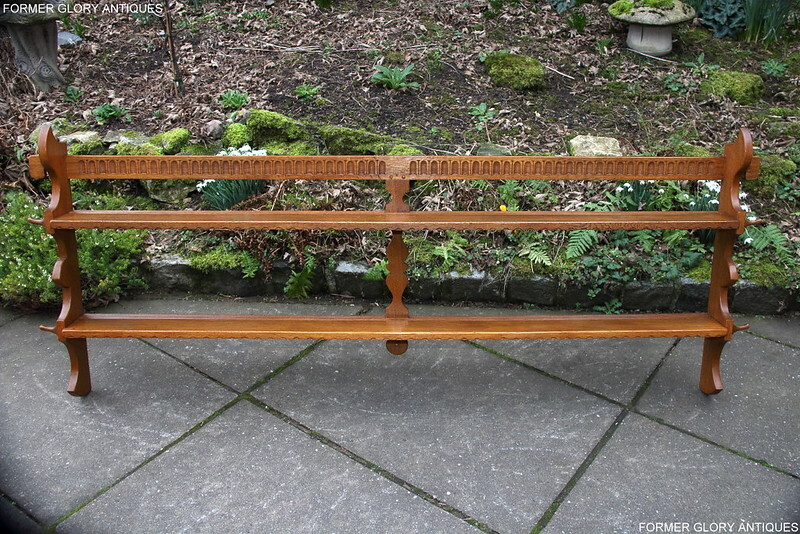 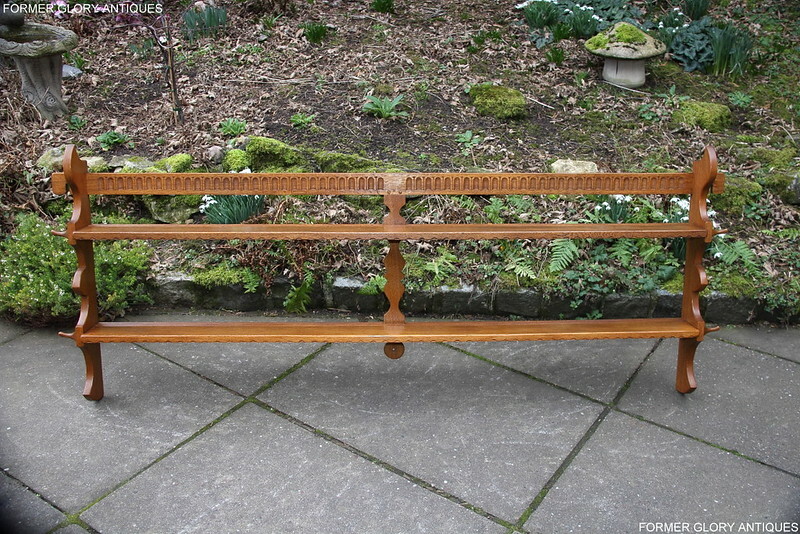 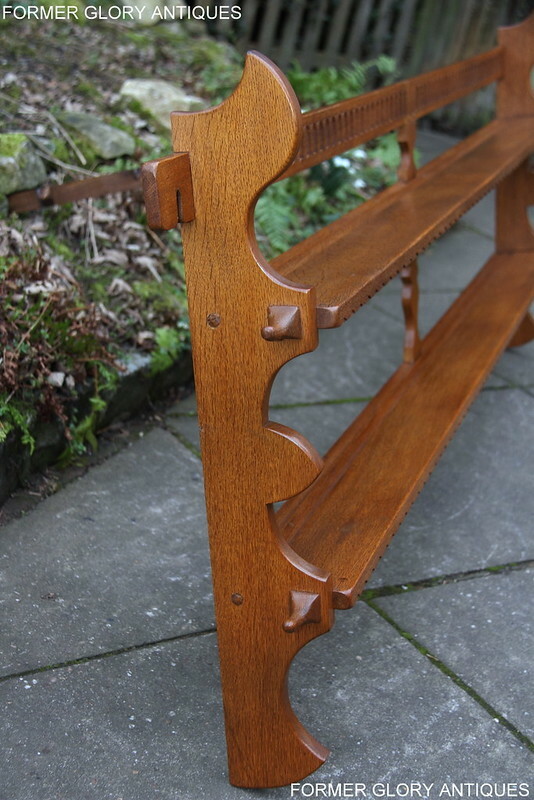 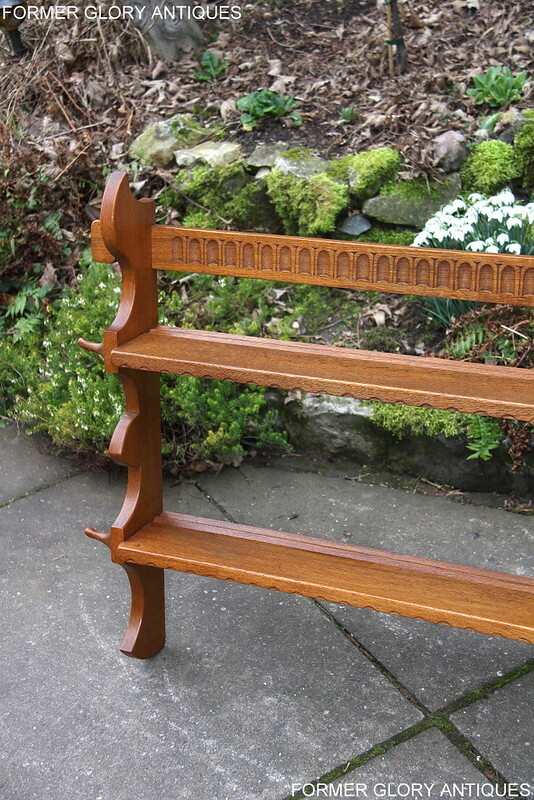 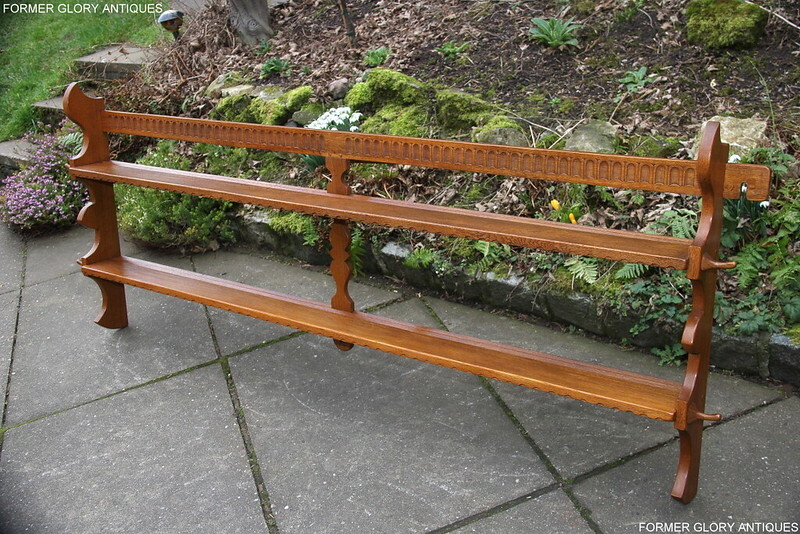 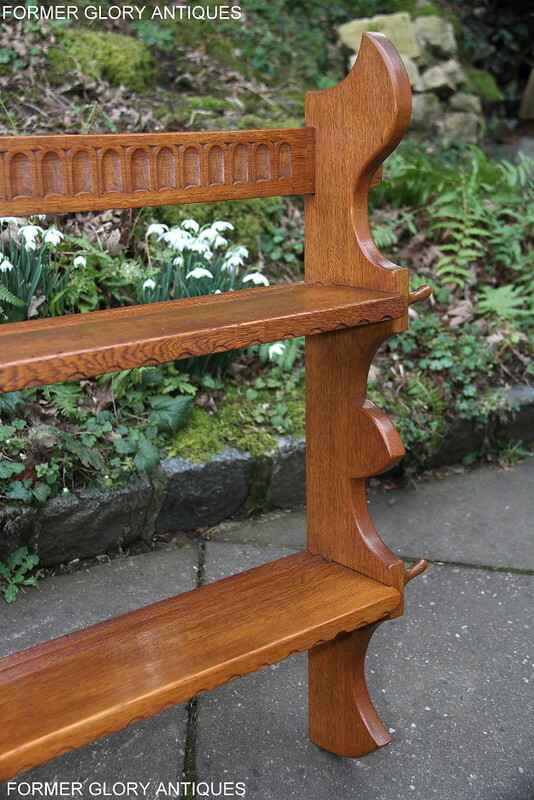 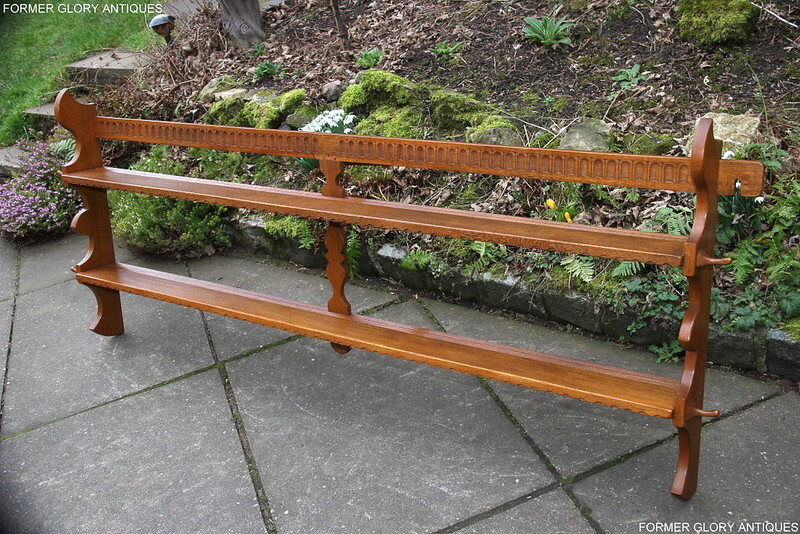 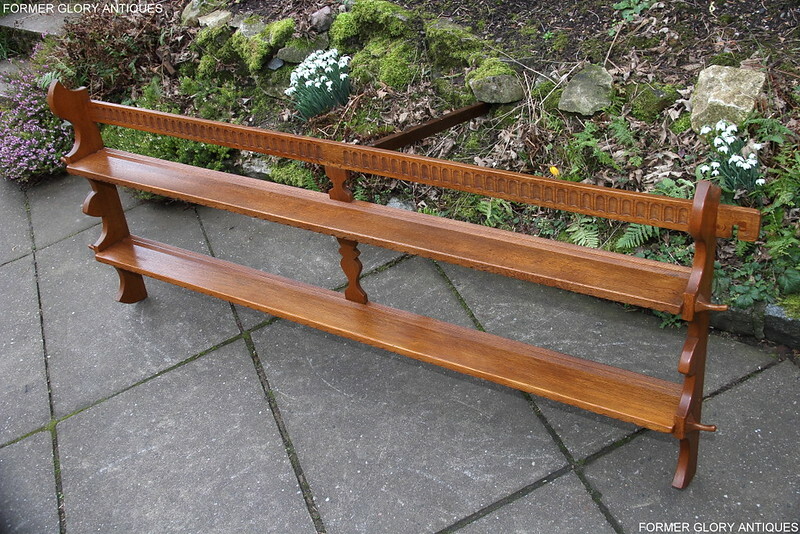 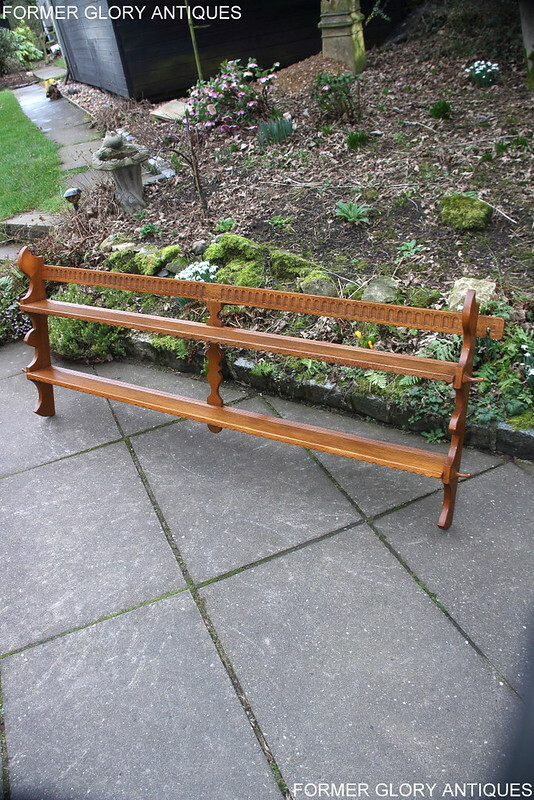 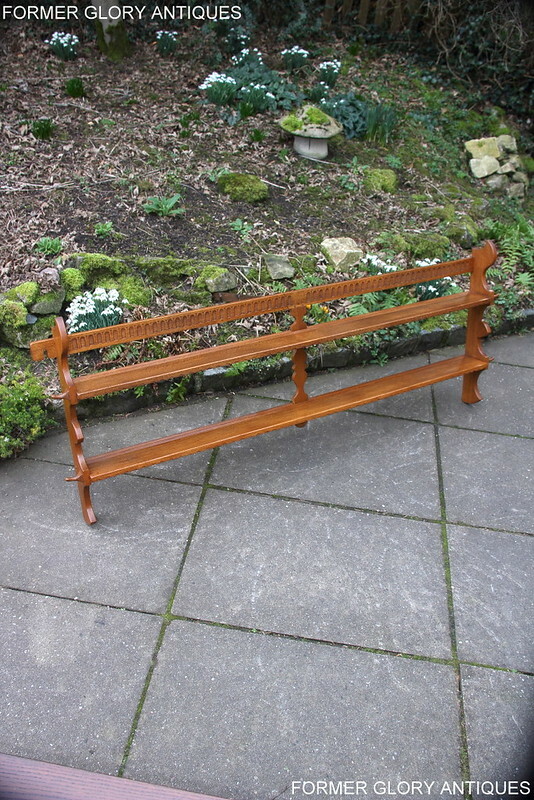 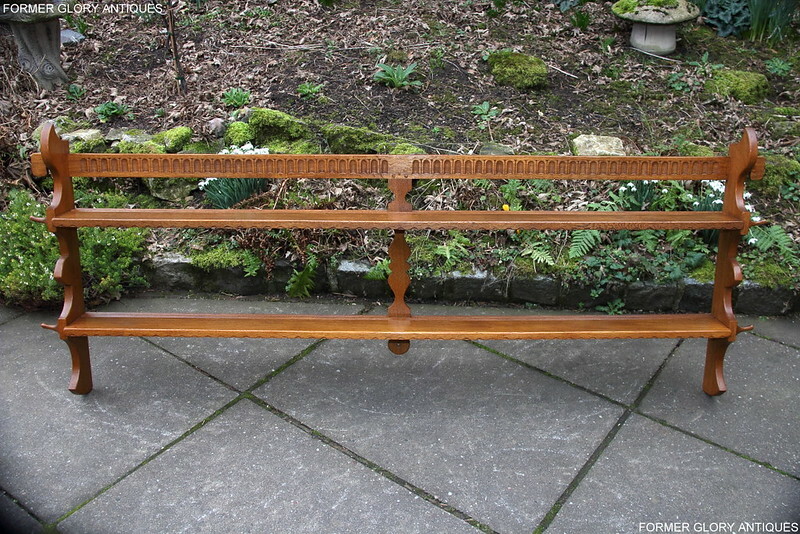 THIS SUPERIOR QUALITY, 'RUPERT GRIFFITHS', 'HAND-CRAFTED', SOLID OAK, 'DELPHER RACK' HAS BEEN CLEANED, RE-POLISHED, IT IS IN EXCELLENT CONDITION THROUGH-OUT AND WOULD BE A VERY USEFUL AND ATTRACTIVE ADDITION TO ANY HOME! 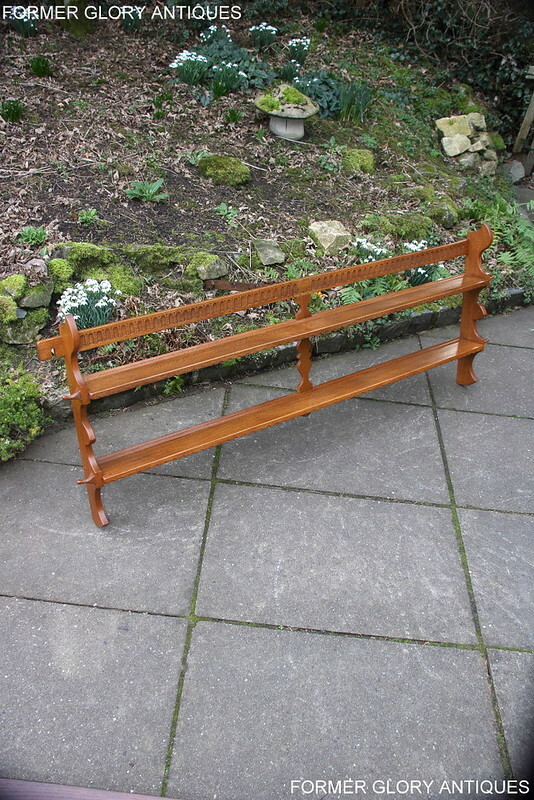 HEIGHT 30 1/4", WIDTH 78", DEPTH 5 5/8". 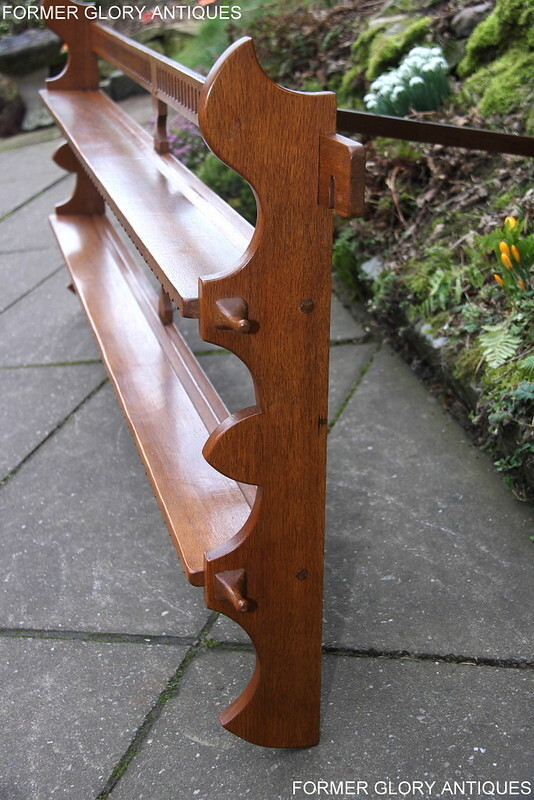 THE MATCHING 'RUPERT GRIFFITHS' SIDEBOARD BELOW CAN BE FOUND FOR SALE ON A SEPARATE LISTING!